“Improving the quality of implementation of Rural Development Programmes (RDPs)” is one of the common objectives of National Rural Networks (NRNs) and the European Network for Rural Development (ENRD). 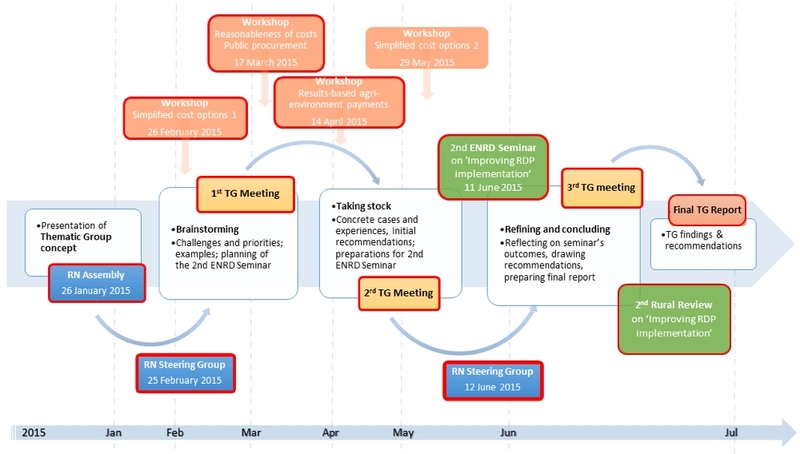 The overarching aim of the ENRD thematic work on ‘improving RDP implementation’ was to provide those directly or indirectly involved in RDP implementation with knowledge and tools to address key challenges and improve programmes’ performance from the outset of the 2014-2020 programming period. Identify key priorities and challenges in terms of programmes’ delivery and performance. Identify and illustrate possible approaches and solutions to be adopted for addressing the recognised needs and opportunities, highlighting the possible role of rural networks. Raise awareness of practical and administrative constraints to delivery and highlight needs for further action. Share experiences in delivering approaches and distil factors for success (or failures). The work of the TG has been based on exchanging views and experience among key rural development stakeholders in the framework of working meetings. The membership of the TG was open and voluntary. Members included representatives from Managing Authorities, Paying Agencies, organisations sitting in programmes’ Monitoring Committees, advisors, EC policy officers and other stakeholders directly or indirectly involved in the design and implementation of RPDs.